How to create an item based assessment, add items, link standards, and save. 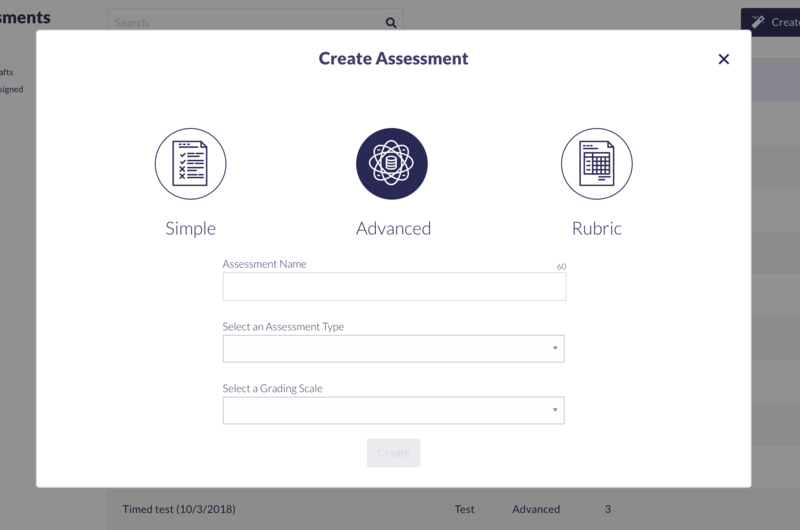 The assessment module in Otus provides you with over 60 types of items to create powerful and interactive assessments for students. 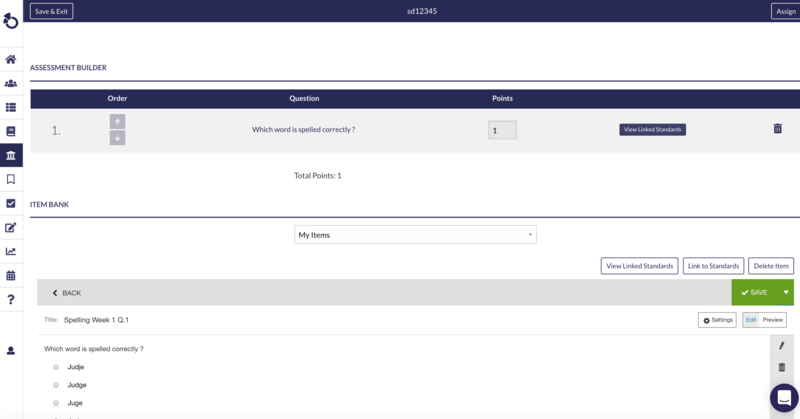 If you have already created your assessment are interested in learning how to Assign the Assessment to students, click here. 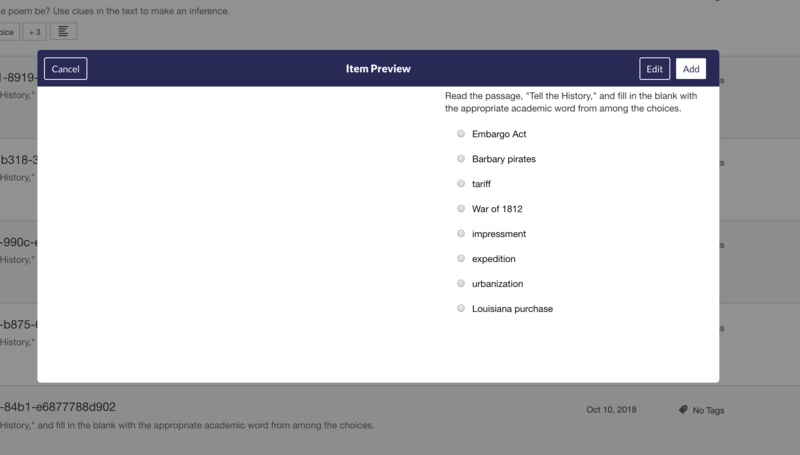 To create an assessment, select Assessment from the lefthand menu. 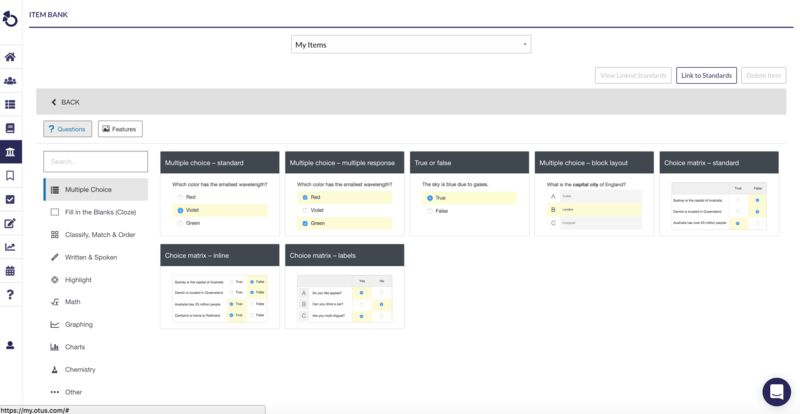 Select Create Assessment at the top right hand corner. 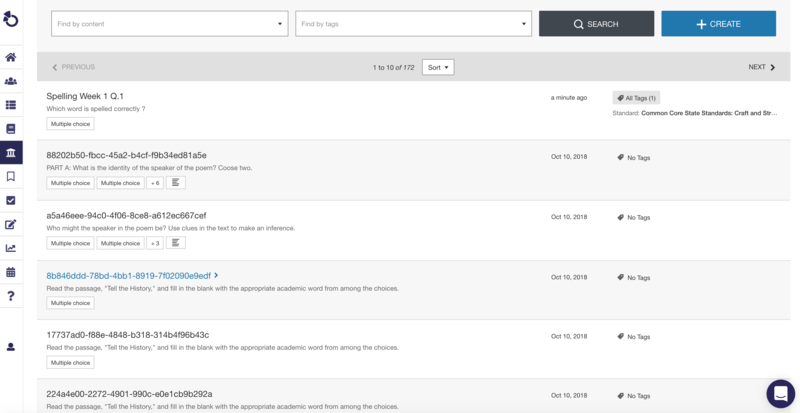 Select the Advanced assessment option, enter the Assessment Name, Assessment Type, and desired Grading Scale. 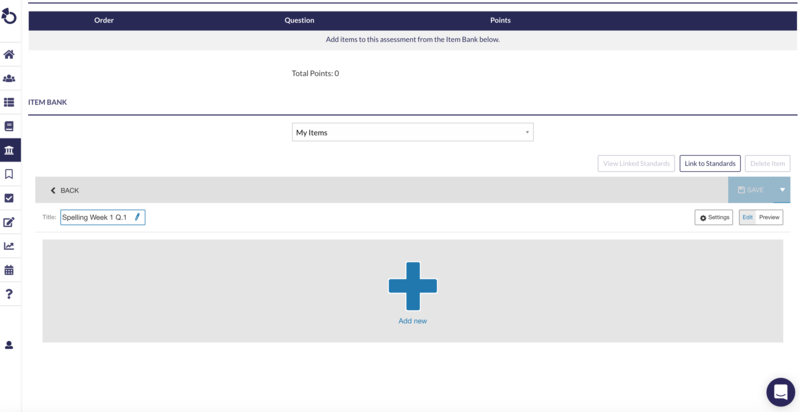 *Please note: the Assessment Type does not affect the format of your assessment but will allow you to categorize and weigh the different types in your gradebook if you wish. Select the + Create button to create and add a new item to your assessment, or scroll down to access previously created items within your Item Bank or the Inspect Item Bank. Enter a title for your item. This is optional, but adding a title will allow you to easily search for items within your item bank. Select the + icon below your new title. Select the desired item type from the list on the left of the page. 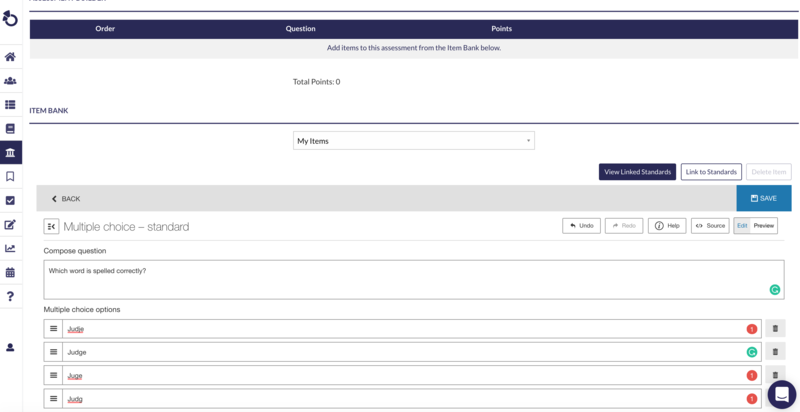 After selecting the desired item type, enter the question that you are asking students into the Compose Question field. For the purposes of this tutorial, we will be creating a multiple choice question. For more information on building our different question types, click HERE. Add answer options into each appropriate field. Scroll down the page to Scoring. Select the correct response(s) from the list. If you would like to make the question worth more than 1 point, you can change the number next to Point(s). If you would like to attach standards to the item to track mastery, click Link to Standards above the item save button. Use the dropdown menus to select the standard you wish to link, then click Done. Once the standard is attached, the View Linked Standards button will no longer be greyed out. You can select that to see which standards have been attached to the item you're editing. Scroll up and select Save on the gray toolbar. Once saved, the button will turn green. The item you just created will automatically be added to the assessment you're building, and will also be added to the top of your item bank to put into future assessments. If you want to add any previously created items in your item bank, scroll down to view them, select the item you want to add, and then select Add in the top right corner of the pop up window. The item will be added to the assessment order list. When multiple items are added to the list, you may adjust the order of the items by selecting the upward or downward arrow icons. Select Save & Exit at the top left corner of the page. 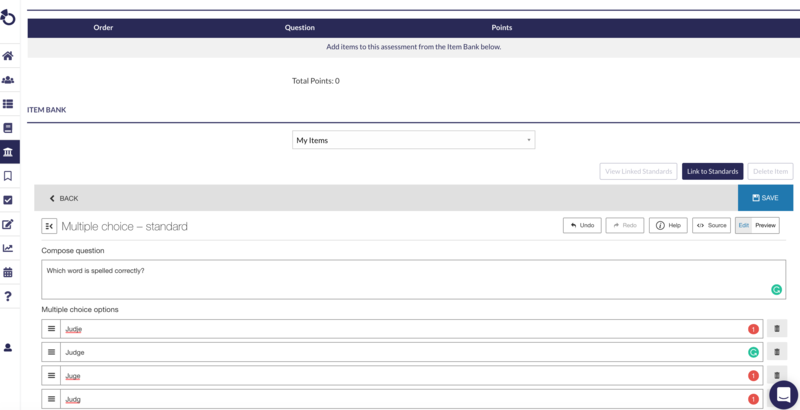 Now that you have created an assessment, you will need to assign it to your class(es), flag(s) or individual student(s) so they can access the assessment within their account. 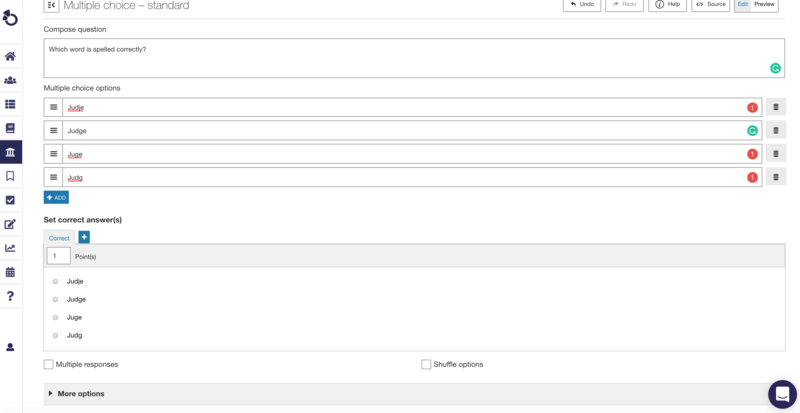 Just hover over the assessment and select "assign. It will prompt you to choose information to assign the assessment to the right students. Congratulations! You have created an assessment in Otus!